Given that I am currently a student, long weekends aren't really a big deal for me, except of course for the fact that my whole family are around! 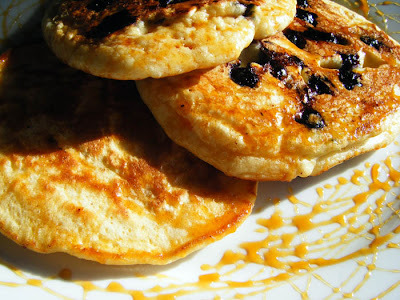 Long weekends call for large, languid breakfasts so after yesterday's eggs benedict I thought I would go for a sweet option and make a trusty favourite- blueberry pancakes. This is a breakfast that Carys happily scoffs, which is always a bonus. She did alot of the mixing (and eating of blueberries-while still frozen!) too, which I find always encourages the eating afterwards! I used Nigella's trusty pancake recipe (from Nigella Bites) which I have adapted, this time I used up some spare egg whites from the fridge, whipped them up with a couple of tablespoons of sugar and folded it through (I reduced the milk a little bit). This always produces a lovely light pancake, which makes a nice change from the usual method. 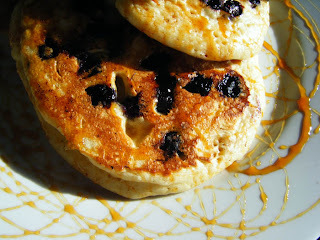 The pancakes got smothered in our lovely apple syrup, which I need to make more of! Those pancakes look just what is needed in my household for a weekend b/fast. Gosh they look so scrummy! !